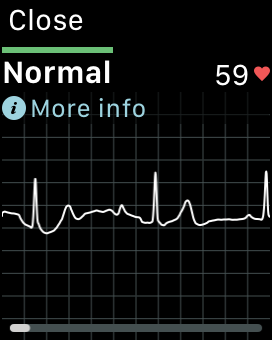 What Is Behind The Significant Changes In AliveCor’s Kardia Mobile ECG App? The Skeptical Cardiologist is a strong proponent of empowering patients with atrial fibrillation by utilizing personal cardiac rhythm devices such as Afib Alert or AliveCor’s Kardia. 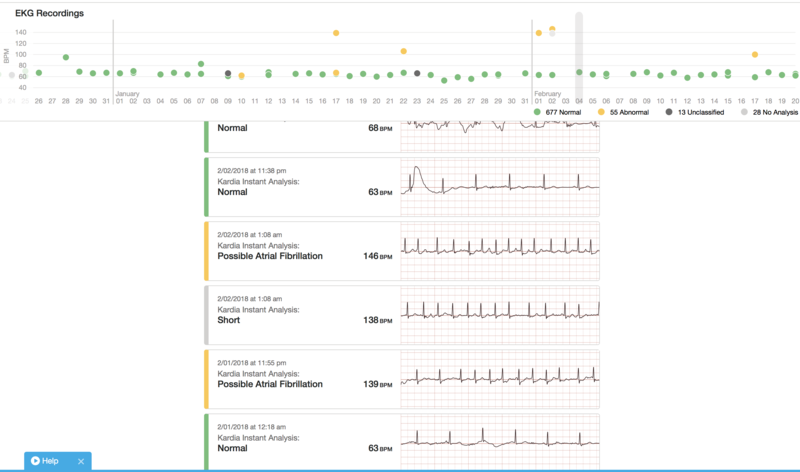 I’ve written about my experiences with the initial versions of the Kardia mobile ECG device and the service it provides here and here. 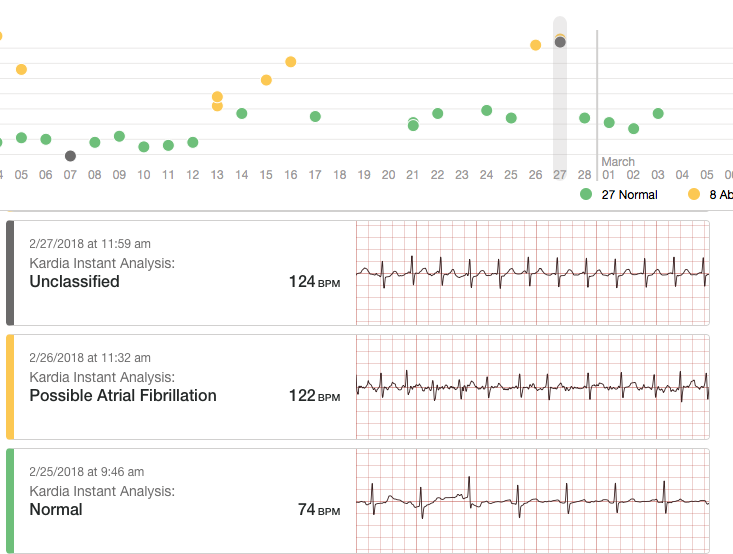 I have been monitoring dozens of my afib patients using AliveCor’s Physician Dashboard. Recently AliveCor changed fundamentally the way their app works such that for new users much of the functionality I described in my previous posts now requires subscribing to their Premium service which costs $9.99 per month or $99 per year. phones is unchanged and still generates a “medical-grade” single lead rhythm strips which appears within the Kardia app. 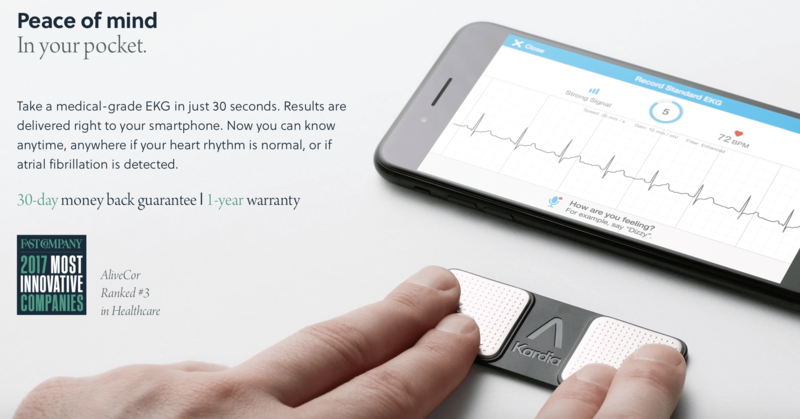 Screenshot from AliveCor’s website showing the Kardia recording device being utilized with the obtained typical ECG recording displayed on the smartphone app. The app still is reasonably accurate at identifying atrial fibrillation or normal heart rhythms and offers a fee-based service for interpretation of unclassified ECGs. However, for new purchasers of Kardia, the capability to access, email or print prior ECG recordings has gone away. 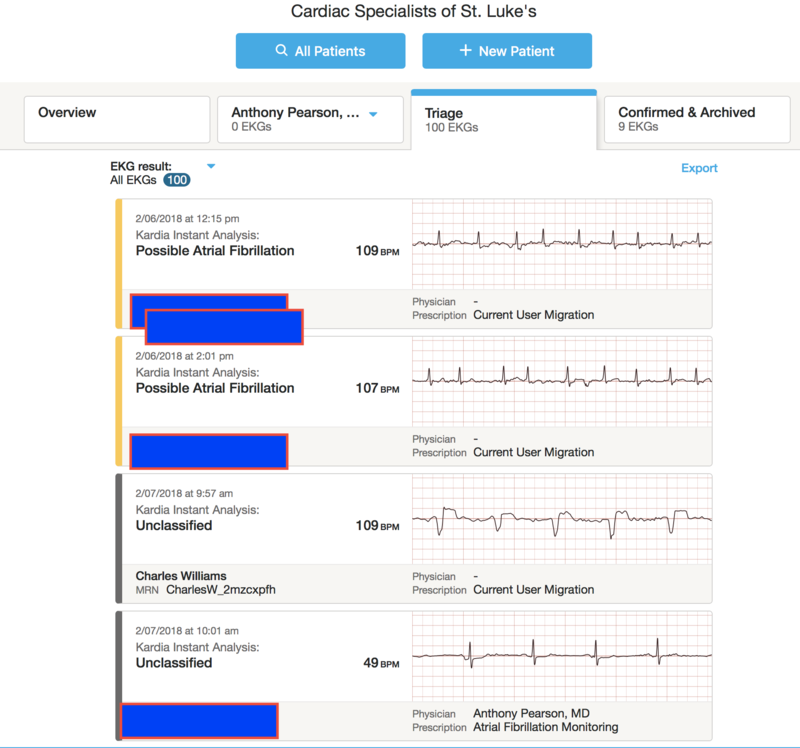 Prior to March of this year, Kardia users could access prior ECG tracings which were stored in the cloud by touching the “Journal” button on the app. These older tracings could be emailed and they were available through the cloud for a physician like myself to review at any time. Now new Kardia purchasers will find that when they make an ECG recording they have the option to email a PDF of the ECG but once they hit the DONE button it is gone and is not stored anywhere. For my patients purchasing after March, 2017 this means that unless they purchase Kardia Premium service I will not be able to view their ECG recordings online. We added a significant number of features over the past year and a half, and grandfathered all users on March 16th, 2017. New users now have the option to download and use Kardia for free, but the premium services are $9.99/mo or $99/year. 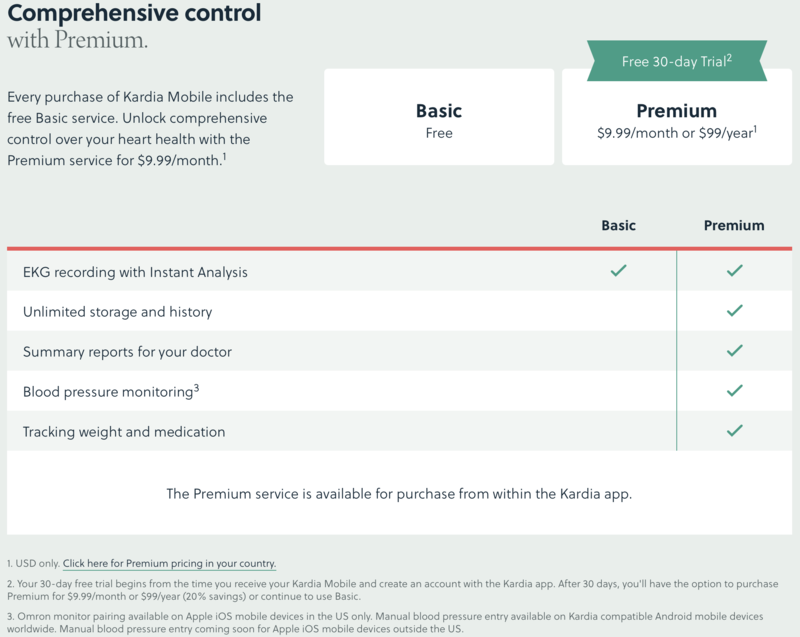 Kardia Premium allows unlimited storage and history of their EKGs, summary reports with longitudinal data, blood pressure monitoring and tracking weight and medication. If you purchased your AliveCor/Kardia device prior to March 16th, 2017 ago the journal functionality still works. Let’s call such customers “Journal Grandfathered”. My Journal Grandfathered patients can bring their phones with them during an office visit and we can review all of their ECG tracings. Journal gGandfathered Kardia users can email their old tracings to their physicians or to anyone they wish (even the skeptical cardiologist!). They can also print them out and save PDFs of the tracings. I can view through my online physician account all of my Journal Grandfathered patients. This means any time a patient of mine makes a recording that is unclassified or suggests atrial fibrillation I can be notified and immediately view it online. This fundamental change took place as AliveCor attempts to convince purchasers of the Kardia device to use their Premium service. Dr. David Albert, inventor and cardiologist and the founder of AliveCor was kind enough to talk with me about this change. He indicates that of the 150,000 AliveCor users, 10,000 are now using the Kardia Premium service. About 20% of new users elect Kardia Premium. Prior to the change all AliveCor users had their old ECG recordings stored in the cloud in a HIPPA compliant fashion. This free service was costing AliveCor quite a bit and the company felt it was best to switch to a subscription service to provide this secure cloud storage. Kardia Premium allows unlimited storage and history of their EKGs, summary reports with longitudinal data, blood pressure monitoring and tracking weight and medication. I’ve looked at the Premium service and it seems quite useful when combined with a connected physician utilizing Kardia Pro. I’ll evaluate the Premium service and the physician Kardia Pro service further and write a full post on its features in the near future. 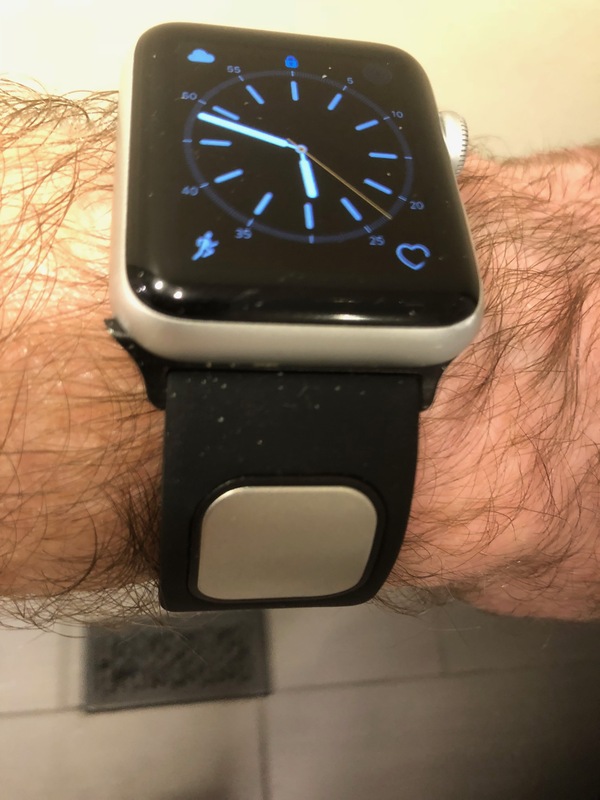 If you are not grandfathered and want to stick with the Basic Kardia service you still have an immensely useful and inexpensive device which allows personal detection of your cardiac rhythm. 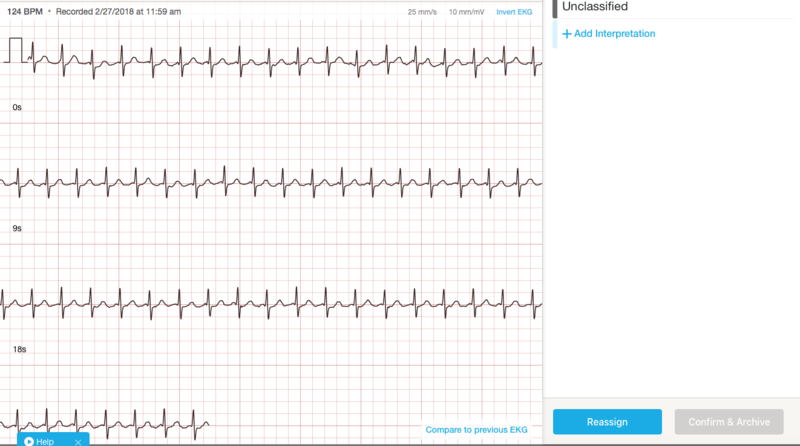 Just remember to email yourself the ECG recording you just made before you hit DONE.